The Student Council is now taking orders for 22″ holiday wreaths complete with a red velvet bow. 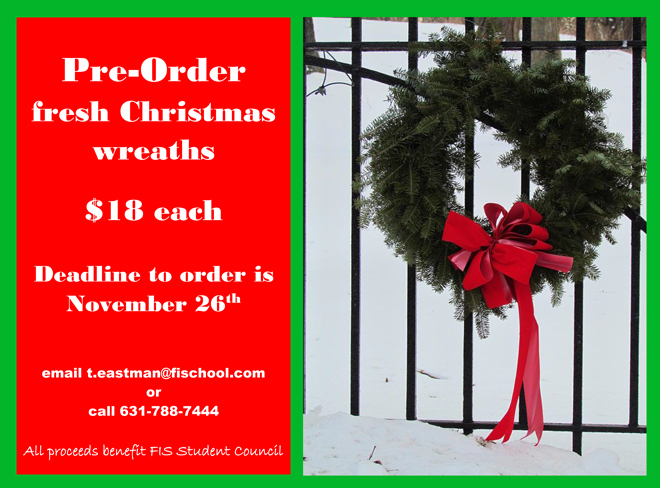 Wreaths are $18 each and can be ordered via email through t.eastman@fischool.com or by calling the school at 631-788-7444. Orders must be submitted by Monday, November 26 and wreaths will be available for pick up at School the first week in December. Proceeds go to the Student Council activities. Checks may be made out to FI School with Student Council Wreaths in the Memo. to the School by Monday, November 26.